In the early days of the Bush/Cheney/Obama wars over a decade ago, congressman Walter Jones earned himself notoriety and derision as the instigator of the "Freedom Fries" incident. In a ridiculous protest against France's unwillingness to assist the US war machine in the Middle East, he publicly declared that the "fries" served in the congressional cafeteria should no longer be "French". Jones has served in Congress since that time, continually earning re-election, albeit with little or no coverage from the press. There is a reason the press has not been covering the popular and outspoken Mr. Jones. It is because almost immediately after "Freedom Fries", Jones realized that the wars were fraudulent in nature and did not serve America. He has ever since been a consistent "no" vote on war, putting most of his fellow congressmen, including most Democrats, to shame. He has also been something of an authentic "Tea Party" conservative and Ron Paul ally, voting more clearly along limited-government lines than most of his colleagues. Libertarian: Pallas square Saturn and Uranus, rulers of Sun and Mercury. Authoritarian: Pallas quincunx Pluto and widely conjunct South Node. Overall, this is one of those unusual cases (like Harry Reid) might look like a toss-up. Perhaps if we had a time of birth, the situation would be clearer. 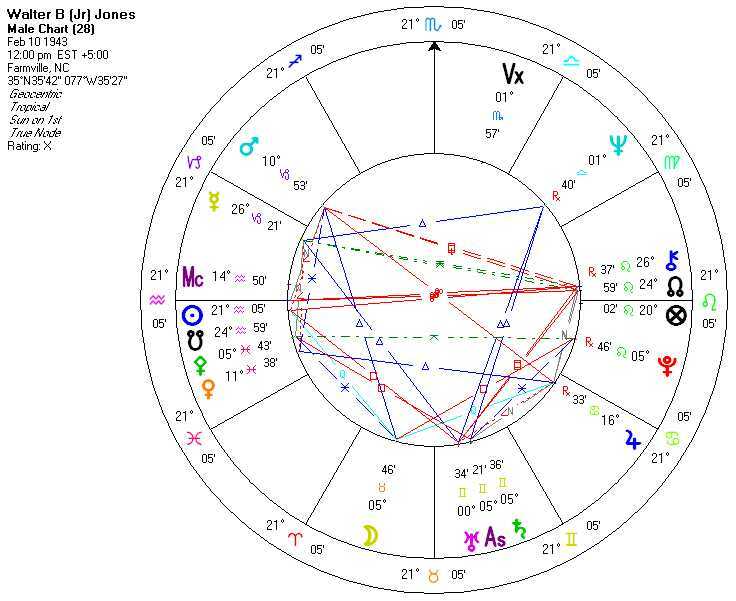 Then again, Pallas connecting to both Sun and Mercury is both unusual and a very strong libertarian pull. Capitalist: Venus quindecile North Node. Conservative: Moon extremely likely ruled by Venus which is quindecile North Node.